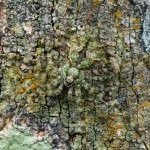 In The Art of Deception – part 1 I showcased some of the insects and spiders that use camouflage to avoid detection by predator and prey alike. This time it’s the turn of the real liars – the creatures that steal the identity of others for their own gain. These are the mimics that I find truly fascinating. Mimicry can take on many forms, but perhaps the most common form is called Batesian mimicry, which is where a harmless creature mimics another creature that is harmful in order to avoid predation. For example, many flies in the family Syrphidae, aka Hover Flies and Drone Flies, have the same colours and patterns as bees and wasps. In fact, the wasp-like patterns are quite popular in other insect orders, too. A few beetles from the family Cerambycidae have the classic black and yellow patterns and some even behave like wasps, Hesthesis species being a prime example. Unlike most beetles, Hesthesis have very short forewings (elytra), so most of their membranous hindwings are in full view, adding to their wasp-like appearance. Hesthesis sp., possibly H. plorator). To you and I, many of the Batesian mimics are pretty obvious frauds, but to some predators the ruse may be enough to make them have second thoughts about taking a bite. Below is one example I came across in the rainforests on Mt Glorious, a magnificent conservation area not far from Brisbane, Queensland. On the left is one of the most infamous ants going around. It is the large jumper ant called Myrmecia nigrocincta and it is feared by most insects and spiders. It is a notoriously aggressive ant with a powerful sting and its ability to jump gives it the edge when hunting prey. On the right is a Longhorn Beetle from the family Cerambycidae and possibly from the genus Ochyra. The differences are obvious, but the colours alone were enough to make me do a double take when I first spotted this beetle. 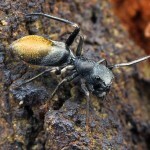 Like the ant, it has the orange antennae and black and orange legs, and even the ends of the elytra look somewhat like the ant’s black and gold gaster. It’s far from the perfect disguise, but it’s not bad. But there are some mimics that are very convincing. When I was in southeast Queensland in 2014, I tried to take a photo of what I thought was one of the common Spider Ant species (Leptomyrmex rufipes) running along a leaf in the rainforest in Kondalilla National Park. It was moving quickly and I completely blew the shot, only getting half the ‘ant’ in the frame. It was only when I had a proper look at the photo later on that I realised that I was looking at the back half of a beetle. 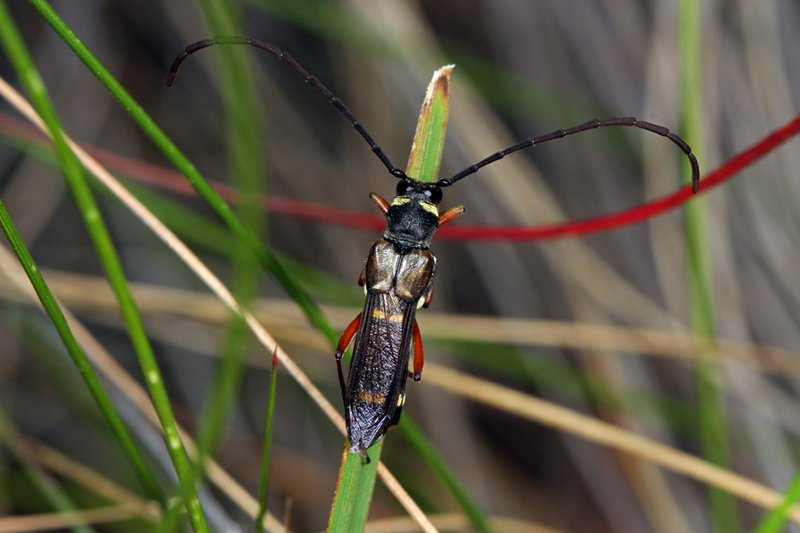 A quick bit of research revealed that it was a Longhorn Beetle called Formicomimus mirabilis. Needless to say I was then even more disappointed, but a year later I was back in southeast Queensland, this time at Mt Glorious, and I hadn’t even walked out of the carpark when I spotted what I again thought was a Leptomyrmex rufipes resting quietly on a leaf. As I approached I began to realise there was something a little different and lo and behold it was another Formicomimus mirabilis! I managed a single shot before it scuttled off and I couldn’t help but be amazed by its very ant-like movements. Left: Leptomyrmex rufipes, a species of Spider Ant from the subfamily Dolichoderinae. Right: Formicomimus mirabilis, a Longhorn Beetle from the family Cermabycidae. And there are a few insects that have decided that looking like another insect isn’t enough. One very common trait is eye spots. Many butterflies and moths have them on their wings and what better way to scare the life out of a predator than by flashing one or two pairs of large beady eyes at them. After all, large eyes must belong to large creatures, right? The big, beautiful moths from the family Saturniidae offer some of the best examples of this. 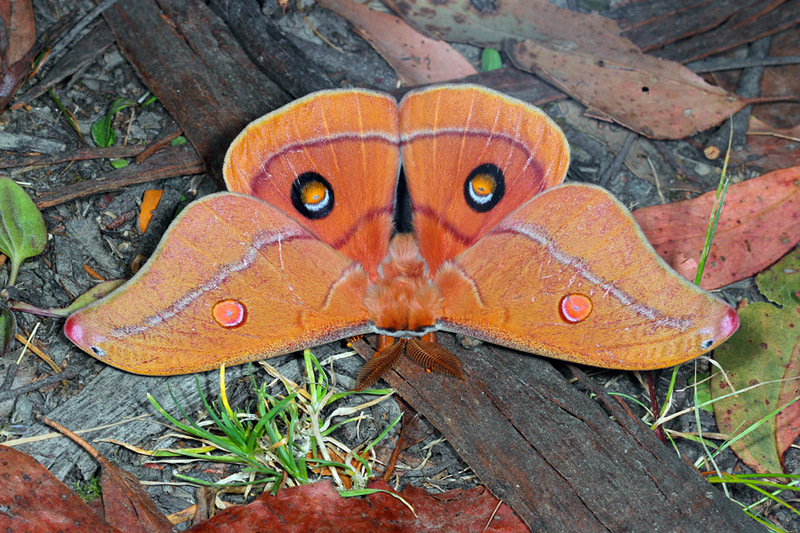 A Helena Gum Moth, Opodiphthera helena, showing off its impressive owl-like eye spots. There are also cases when a harmful insect mimics another harmful insect, which is referred to as Mullerian mimicry. It’s almost like using a universal language to let predators know that all insects with a particular pattern are not to be trifled with. Many species of bees and wasps exhibit similar black and yellow stripes. Another example is the beetles belonging to the families Lycidae (Net-winged Beetles) and Oedemeridae (False Blister Beetles). Many species in both of these families are orange and they are all unpalatable. In fact, orange appears to be such a good deterrent that it is used by a broad range of insects, including many that are harmless and edible. In the centre is a Porrostoma sp., a highly toxic beetle from the family Lycidae. Surrounding it are seven other beetles and a moth, some toxic, some not. 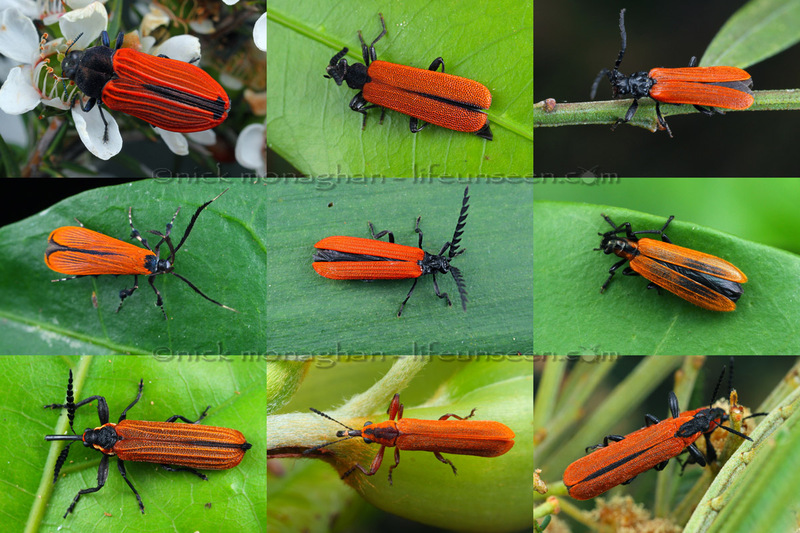 Clockwise from top left: Castiarina erythroptera (Buprestidae), Morpholycus monilicornis (Pyrochroidae), unknown sp. (Lycidae), unknown sp. (Cleridae), Rhinotia haemoptera (Belidae), Rhinotia simplicipennis (Belidae), Rhinotiodes spinipennis (Belidae), and Snellenia lineata (Oecophoridae – moth). And of course we can’t forget the spiders. Ant-mimicry is very common amongst insects, but some of the spiders have got it down to a fine art. Of particular note are the Myrmarachne species jumping spiders from the family Salticidae. Some of them are remarkably good ant-mimics, right down to the way they wave their front pairs of legs around like ant antennae. This mimicry is quite useful because studies have shown that although jumping spiders are quite happy to eat other jumping spiders, they tend to avoid the ant-mimicking species, especially since the ant-mimics tend to stay in close proximity to real ants. 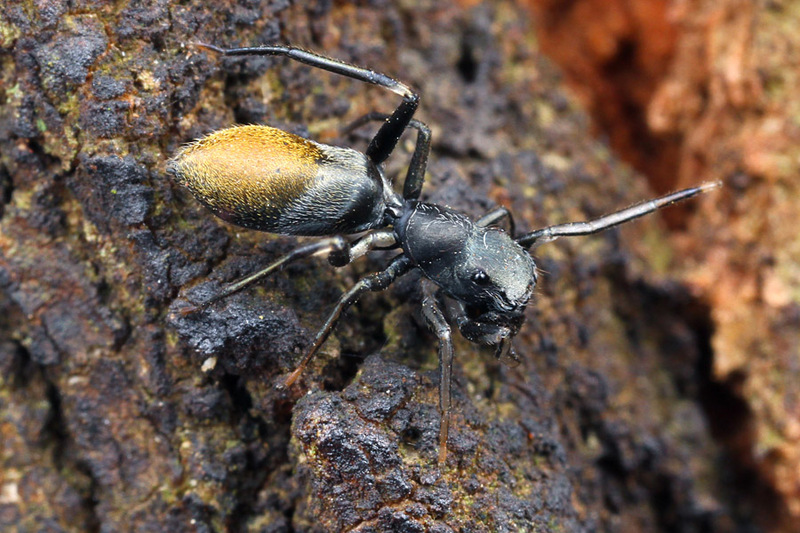 There are even rare occasions when ant-mimicking spiders can be called aggressive mimics, i.e. they use their disguise to get close enough to ants to attack and kill them. Very devious, indeed. The Myrmarachne species on the right appears to be a mimic of Myrmecia pilosula, aka Jumping Jack. That’s a great idea because no one messes with Jumping Jacks. There are so many examples of mimicry in the invertebrate world that it’s impossible to list them all, suffice to say they are all truly remarkable. 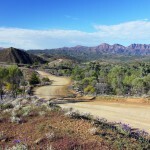 Whenever you are out in the bush and you come across an insect or a spider, always take a closer look because not everything is what it seems.